Graduated at computer engineering on POLI-USP and an education lover. Math, physics and chemistry volunteer teacher in a social project. Loves to solve magick cubes with all size and shapes. Read all articles published by Marcelo Mita. Amazon Web Services (AWS) has announced in April of this year, during AWS Summit San Francisco, the new storage service, the Amazon Elastic File System (EFS). This product, still in preview, will be lauched in June and will be available initially on regions US-West (Oregon), US-East (N. Virginia) e EU (Ireland). AWS has already other 3 storage services the Amazon Simple Storage Service (S3), Amazon Elastic Block System (EBS) and Amazon Glacier. Let's briefly compare these services and the brand new EFS. EFS' main features are that the file system is elastic, scalable and can be shared between thousands of EC2 instances. This sharing is very simple and fully managed. It's simple to use because it provides standard file system semantics and it acts like any other file system that you can mount on your EC2 instance. You can mount it on many instances in an Amazon region and it will be automatically shared with any other instance in which you mounted the EFS. This way you garantee high durability and availability. The EFS is completly scalable and eslastic and can grow up to PB. The elasticity is automatic, that means it's not necessary to require more or less disk space during your use. It has no minimum storage space to start using EFS. Another important feature is the high performance. SSD-Based, EFS is designed to have high throughput, IOPS and low latency. These features are automatically scalable while your file system grows. Network: Only EC2 instances inside the same VPC can mount the file system. Security groups: It's possible to restrict which security groups that can access the EFS. User: Common file system permissions can be apllied to folders and files inside EFS. 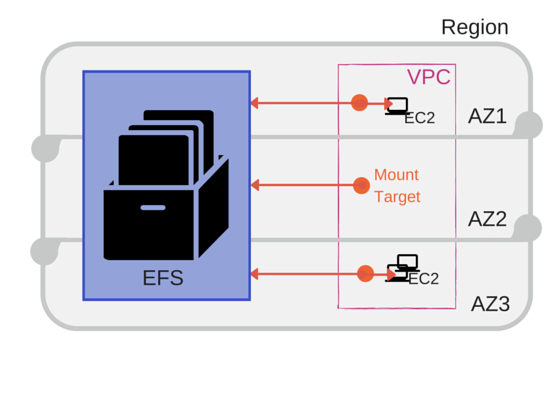 To access files into EFS on an EC2 instance it's necessary to mount the system. You have to create mount targets in each availability zone. Mount targets are EFS endpoints and have one IP address and a DNS name. When you create a EFS on AWS you receive these DNS names of each AZ. These names are used when you mount the file system on your EC2 instances. The figure shows the structure of EFS working flow. EFS is in preview and as soon as we have access to the preview, we will demonstrate this tool.